My work has been featured in software, books, an academic article, a desk calendar, and even a radio program. No matter what the medium or topic, I've always been interested in learning. When I have something to share, I hope to inspire and entertain. But at the very least, I strive to make people think. As a member of the KFTF team during my first year in the MLIS program, I had the opportunity to work alongside researchers in the personal information management field. Our group published a joint paper on the Project Planner -- a research tool I helped develop. For my editing efforts and suggestions I was also given an acknowledgement in William Jones' book titled Keeping Found Things Found. Jones, W., P. Klasnja, A. Civan, & M. Adcock (2008). 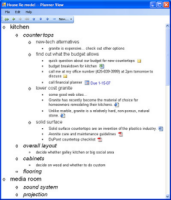 The Personal Project Planner: Planning to Organize Personal Information. ACM SIGCHI Conference on Human Factors in Computing Systems (CHI 2008), Florence, Italy, ACM. I have dabbled in origami since high school, and enjoy the way it combines logic and creativity. Three of my creations have been diagrammed and featured in books. Shown at left are Alfred Hitchcock, the Bluebird of Happiness (a.k.a. "Dove" in the calendar), and the Jester. My origami exploits were also featured in a radio program on NPR, called Engines of Our Ingenuity by Dr. John Lienhard. Thanks to J.C. Nolan and Kay Eng for giving me permission to post their diagrams for Alfred Hitchcock, the Bluebird of Happiness, and the Jester! Originally a team effort, I ended up creating this graphics and sound patch for Wolfenstein 3D on my own. I also wrote and provided a short story (an extension of this one), threw in some demo animations, a setup program, and an ASCII art exit screen. To my amazement, Barneystein has appeared in Wikipedia, on YouTube, and is still available for download from a few sites (Colonel Bill, Wolf3D Dome). Googling brings up many references which show I also inspired a similar Doom patch by Bill Neisius, and a Mac version, among others. I didn't create the tool, but when I saw the ever increasing number of mods, I decided to put together a little FAQ to help people identify and find the patch files. I also created some patches myself. My document has been included on several CDs and referenced in a few books. Referenced in Let Me Play: Stories Of Gaming And Emulation by Radford Castro (seen at left), this rather large FAQ was my attempt to document countless conversations on various email mailing lists and several Usenet newsgroups. From the feedback I received, and the fact that a Google search will still retrieve many copies and references, I'm very happy that it has helped inspire and entertain people. The final version can be found here.